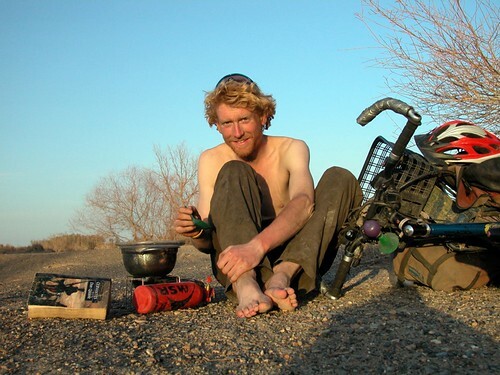 Alastair Humphreys spent fours years cycling 46,000 miles around the world. He chats to us about his first stop, France. Alastair sets up camp in China on his round-the-world ride. 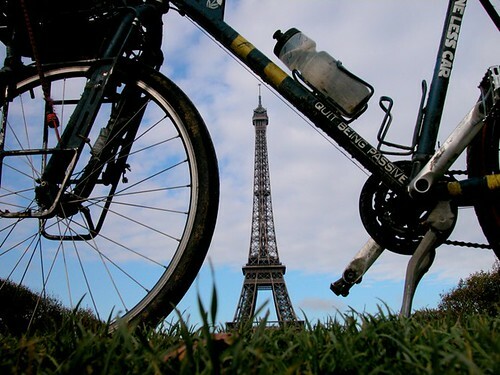 What was your first impression of cycling in France? My first impression was that it was surprisingly similar to England (except that they drive on the other side of the road). A day or two of riding changed that opinion, but my very first impression was that it was all pleasingly familiar and do-able. France was your first stop on your round-the-world trip. In your diaries, you wrote that “in France I was wet, lonely and cried a lot”. How had this changed by the time you crossed the Belgian border? To be honest it hadn't changed very much! And that is no negative reflection on France. It's just that I had just begun a massive journey, left behind all that I cared about, and was not entirely sure that I had made the right choice. What’s your most vivid memory of France from that trip? Sitting in a café eating a whole warm baguette and being very surprised how much vocabulary GCSE French had supplied me with. I loved the slow pace of village life, the guaranteed quality boulanger, and a nice village square to relax in. Not very scientifically: I more or less chose a straight line from Calais to Sydney. I was so fixated on the length of my journey that it took me a good few weeks to remember to appreciate the here and now. You returned to France in 2009 – this time you rowed across the Channel. How did the two experiences compare? Rowing the Channel was far shorter, but it was a powerful experience as I did it with a paralysed soldier. His achievement was so great that I felt a real glow of gratitude to be involved in that project. But we didn’t see a lot of France: the aim was to row to France and, due to tides, as soon as we reached France we had to jump into a motorboat to carry us back to England! Have you been back to France on your bike since? No, but I would really love to. It's so beautiful, so bike-friendly, so diverse. If you could come back and ride anywhere in France, where would you go? The Pyrenées – I hitch-hiked through these mountains to the running of the bulls in Pamplona a few years ago. I regretted even at the time that I was cooped in a car not outside on my bike. And where would you avoid? There’s nowhere in the world I would avoid – everywhere is interesting and teaches you something. France is often seen as an easier ‘starter’ cycling destination – what would your message about France be to more adventurous riders looking for a challenge or a full touring experience? If it’s tough enough for Lance Armstrong, it’s tough enough for the rest of us! What three items can you always find room for in your panniers? Leatherman, Therm-a-rest, a reading book. Do you have any other words of advice for people thinking about a cycling in France? Go for it! It's a beautiful country, cheap to get to, varied, interesting, not too crowded. There’s a very good reason why not many French people go abroad for their holidays! Shortly after this interview, Alastair started eating his way around the world in London with The Hungry Cyclist, Tom Kevill-Davies. You can follow Alastair's adventures via his blog or on Facebook and Twitter.